Humans have a seemingly primal need to understand how we came to be the way we are today. Pieces of our ancient forebears generally are hard to come by, however. Scientists working to interpret our evolution often have had to make do with studying a fossil toe bone here or a jaw there. 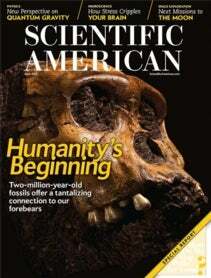 Now, in an amazing bounty, paleoanthropologist Lee Berger and his team have uncovered two well-preserved partial skeletons of Australopithecus sediba that date from nearly two million years ago at a site near Johannes­burg, South ­Africa; the specimens include bones from every region of the body. The bones of at least four other individuals have also been found. Turning to the state of our species today, we offer a special report on polio. Worldwide confirmed cases of the disease, which once crippled hundreds of thousands, have dropped into the hundreds. But eliminating it remains challenging. Medical reporter Helen Brans­well explains why in “Polio’s Last Act.” As you’ll learn in journalist William Swanson’s “Birth of a Cold War Vaccine,” in the 1950s polio terrified the U.S. and U.S.S.R. almost as much as nuclear weapons. To test the oral vaccine, two scientists bridg­ed their countries’ differences. They have saved uncounted thousands from the misery of this ancient scourge. Students ages 13 to 18, you still have time to enter the Google Science Fair: April 1 is the deadline. All entries are automatically considered for Scientific American’s Science in Action award. In add­ition to the $50,000 prize, the winner will get a year of mentoring. Science in Action is a new addition to the Google Science Fair for 2012. The winning project will be able to address a social, environmental or health issue to make a practical difference in the lives of a group or community and may possibly be scaled. To get inspired, watch a video about a Science in Action–style 2011 finalist, Harine Ravichandran, at www.Scientific­American.com/science-in-action. On that page, you can also find a list of our judges and mentors. The Science in Action winner will be announced in June and will join Google Science Fair finalists at the company’s Mountain View, Calif., campus for a special awards event on Monday, July 23. I’m a judge again this year. Best of luck to all entrants.